One of my favourite places to visit (and only 20 or so minutes from our house) is Saltaire. 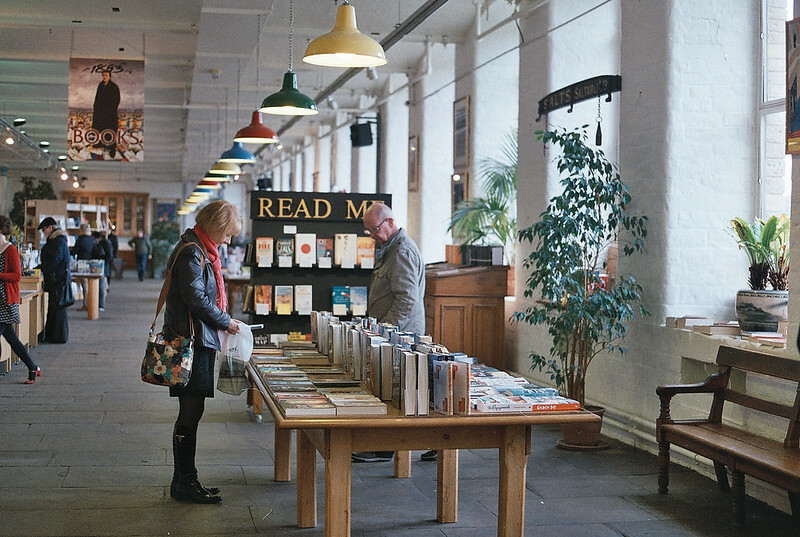 I've shared photos of Saltaire before, but this time I took my Dad's Olympus OM-10 with me, which meant I could take photos of inside the mill, hurray! Salts Mill is a gorgeous building with a fascinating past - it used to be the main mill which the village of Saltaire was purposely built around by Titus Salt and was operational for over 100 years. When the mill was eventually closed in 1986, it was then bought by a man called Jonathan Silver who immediately began renovating it. The mill now houses galleries including, most famously, works by David Hockney (which makes a very happy Rhianne) and also shops, cafes and offices.